Hello lovelies, today's post is a very special one and let me explain you why. A few weeks ago I was contacted by the fashion accessories line Nepali by TDM Design and I got to know that I have been chosen as one of the ambassadors for their line among with a few other amazing bloggers. Needless to say I was so honored and excited! The ideas of entrepreneurship and giving back to community were circling in my head for a while so this was a great opportunity to make these ideas come true. Let me tell you a little bit about the brand: what differentiates Nepali by TDM Design from other brands is that all of their products are hand-made from natural, high-quality materials by a group of women in Nepal. The company has encouraged these women through this work and has enabled them to become empowered, respectable participants in their families in a heavily patriarchal and impoverished society. They receive the above-market compensation, monthly medical care and education for their children. For most of us it might sound so ordinary but don't forget that for some people having a basic medical care can be a privilege. And have you ever thought that an eco-friendly clothes could look so great? You should see their scarf collection, it's wonderful! I'm absolutely in love with my bamboo scarf (the one I'm wearing in the photos), it's so lightweight, soft and perfect for summer -- light enough to wear outside and warm enough for a freezing office. I'm sure you'll find something you love on their website. And by the way, they are offering a 50% off discount for the entire site with the code: COMPUTERS. Wonder why computers? Because Nepali by TDM Design has a goal to sell enough scarves to build a computer lab in the school in the Nepalese village by the end of the summer. Link to the website here. What are your thoughts about social responsibility? Do you take part in it? Wow so beautiful, gorgeous photos - love the chic scarf! If you have a free moment I would so appreciateyou checking out my new coral + mint outfit post! You look amazing! and this scarf is so beautiful! sunflowers are beautiful! lovely pics! simply beautiful love these pictures they're so refreshing! You look lovely! Amazing photos. The sunflowers are a very nice touch! Congrats! You look lovely as always! 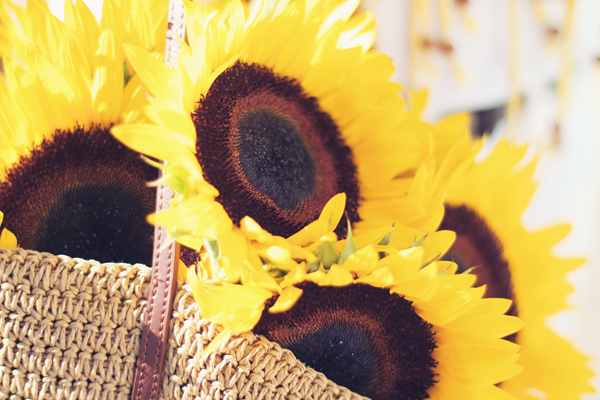 love these photos today more than ever - sunflowers just make you smile right? off to check out the scarves now! amazing outfit and pictures! you're so sweet! Nice!! I also love the flower effect!! What a fun, happy scarf! I love this! Ах, какие красивые шарфики на сайте:) Очень понравился образ. Love the scarf, and what an amazing company, I'll be sure to check them out! Love the scarf El. Such an amazing project for you to be involved in. Hope you keep us posted. 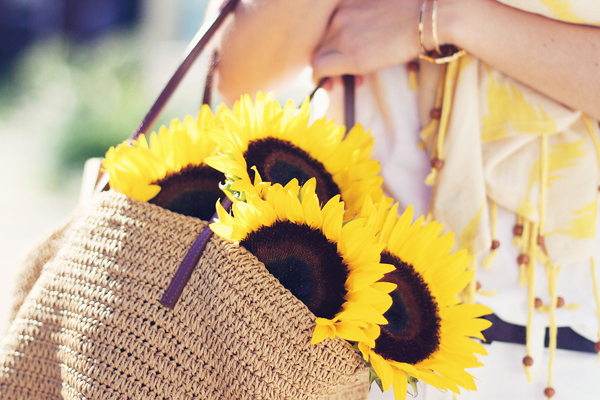 AMAZING photos, i love the sunflowers in the bag, such a nice touch! I love, love, LOVE this!! I love that it's eco-friendly and the pictures are amazing - but your pictures always are. Congrats in such a wonderful opportunity! You just look radiant! And that is an incredibly awesome opportunity, what a great company! Wauw! I love the pictures. So nice and clear. Can I ask you who your photographer is? Amazing photos! :) So pretty! Поздравляю! Это действительно очень важное дело! Безумно красивый шарф придает особый шарм и свежесть образу! wow, I'm in love with this outfit: it's perfect, and your blog is absolutly phenomenal. just find you on lookbook and i love everything! Beautiful!!! I love sunflowers! I was just in Hungary and there were fields and fields of sunflowers. The color touch is amazing!! You are gorgeous! So beautiful! Gorgeous. 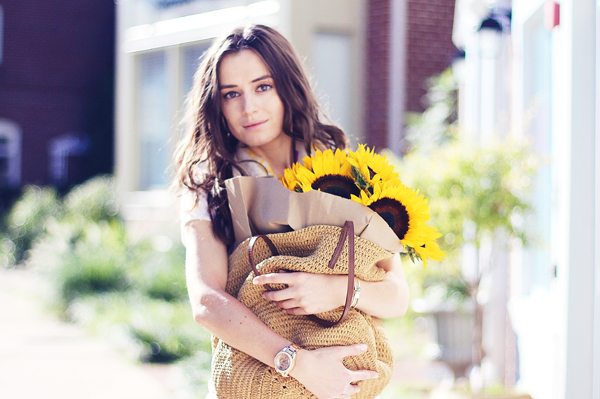 This outfit is so pretty and I love the sunflowers in the photos. Congrats! and absolutely beautiful outfit, love the all white and that scarf!